Former Vandalia Fire Prevention Officer Eric Cook stands with Vandalia’s retired Code Enforcement Officer Kim Hannahan after she received the Ohio Fire Prevention Educator of the Year award. 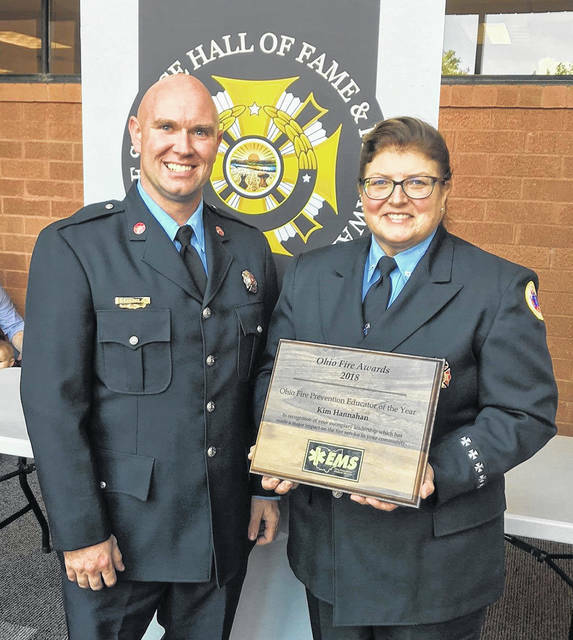 REYNOLDSBURG — Retired Vandalia Code Enforcement Officer Kim Hannahan was recently honored as the Ohio Fire Prevention Educator of the Year at the Ohio Fire Academy in Reynoldsburg. The award is bestowed upon a Fire Prevention Educator who demonstrates innovative, outstanding teaching characteristics and because of these attributes has made a major impact on the field of fire prevention education in their community. Hannahan was nominated by former Vandalia Fire Prevention Officer Eric Cook.